On Aug. 13, 2017, Dayna Bowen Matthew, JD, arrived in Charlottesville, Virginia from Colorado to start her new job as the William L. Matheson and Robert M. Morganthau Distinguished Professor of Law at the University of Virginia. She had intended to arrive two days earlier, she said, but the moving company would not drive into the city on that day, due to a growing conflict between protesters and counter-protesters. Matthew recounted her experience to students and faculty at the Second Annual Dr. Martin Luther King Jr. lecture hosted by the Office of Diversity and Inclusion at the George Washington University School of Medicine and Health Sciences. 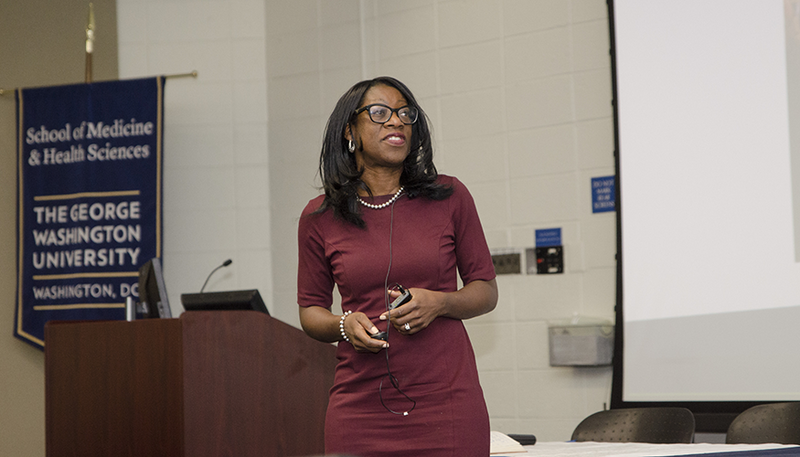 Her lecture, titled “Just Medicine: A Cure for Racial Inequality in American Health Care,” focused on how implicit racial and ethnic biases have contributed to health inequity across the country. Over the course of her lecture, Matthew outlined the impacts of implicit, unconscious bias on health care in “the other America,” referencing a 1967 speech by Rev. Dr. Martin Luther King Jr. at Stanford University. In the speech, King spoke about the contrast between the millions of people who are privileged to be able to pursue happiness, life, and liberty in the United States, as compared to the millions of children who live in poverty. She shared several studies detailing explicit versus implicit biases by physicians about their patients and similarly, those held by patients about their doctors. Those studies suggest that there are instances in which biases can influence the perceptions providers have of their patients and vice versa. Matthew also outlined social determinants of health that minority patients experience outside of the clinical setting, including biases in housing, education, food, and criminal justice. Matthew encouraged the students and faculty in the room to consider the steps they might take to effect the social determinants facing their patients that contribute to health inequity.